Sumner Redstone is Viacom's main man, but the company's biggest brands are run by women. Fortune talks with four of them. (Fortune Magazine) -- Viacom's revolving door - goodbye, Toms Freston and Cruise! - places the media giant's large cast of powerful women in a particular spotlight: as stalwart survivors who keep the businesses going amid the carnage. Viacom (Charts), in fact, has produced more prominent women leaders than any other company since Fortune launched its Most Powerful Women list in 1998. 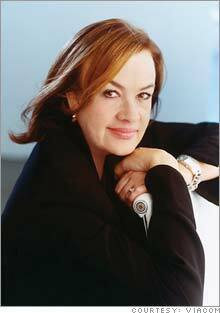 Besides the four stars we spoke with - MTV Networks CEO Judy McGrath (No. 12 in our current ranking), Nickelodeon chief Cyma Zarghami, BET Networks boss Debra Lee and Paramount Pictures president Gail Berman - Viacom has employed, at one time or another, such Most Powerful Women list veterans as Walt Disney's (Charts) Anne Sweeney (No. 13 on our list), retired Paramount chairman Sherry Lansing, Oxygen Media CEO Gerry Laybourne and Lifetime Entertainment Services CEO Betty Cohen. Another list veteran, Stacey Snider (No. 50), left her perch at Universal Pictures this year to take charge at DreamWorks SKG (Charts), which Viacom recently acquired. Viacom's strategy is to serve various segments of the population - and to make sure that its leadership reflects its eclectic audience mix. So even though an old-school octogenarian, chairman Sumner Redstone, calls the attention-grabbing shots, Viacom would be a very different place without powerful women sweating it out behind the scenes. What follows are excerpts from a conversation in Manhattan in late August with Fortune editor-at-large Patricia Sellers about the challenges of power, keeping brands from going stale, competing in digital media - and working for an impetuous boss. Fortune followed up after Redstone fired CEO Tom Freston in early September; those comments are also included here. Viacom's leading women took a variety of routes to power in the media world. Born in Iran and grew up in Canada and New Jersey. Joined kid-centric Nickelodeon as a scheduling clerk in 1985; moved up through programming and crafted Nick's irreverent brand personality. Has run the top-rated cable network since becoming Nickelodeon's general manager in 1996. Stepped into current job in January, overseeing Viacom's TV, movie, online and magazine ventures in the kids' space. Daughter of an Army tank driver and a hospital clerk; graduated from Brown and has two degrees from Harvard (law and public policy). Oversaw strategy at BET; held president and COO roles for ten years. Inherited the top job from founder Bob Johnson in January. Moved to TV after early success on Broadway. Produced hits Malcolm in the Middle and Buffy the Vampire Slayer. Joined Fox Broadcasting in 2000 and launched addictive phenoms American Idol and 24, lifting Fox to No. 1 in primetime. Jumped to Paramount, her first movie gig, last year. 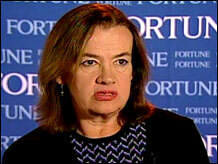 'Don't worry about stepping on toes,' says MTV Networks CEO Judy McGrath from Fortune's Most Powerful Women Summit. You've been leading under fire since January, when Viacom and CBS (Charts) split. Must you encourage the people who work for you by telling them, "All right, Viacom stock is down, but we're still a growth company"? MCGRATH: Never in a million years would I say that kind of thing! What I say is that we're a vast digital entertainment company. We have to make great content every day. Talk about galvanizing a worried workforce! Gail, you've had to do that at Paramount. Has it been more difficult than you expected? BERMAN: No, but the hazing has been harder! [Laughs.] The job is exactly what I expected. What advice did people give you when you arrived at Paramount? BERMAN: One piece of advice was to listen - to not talk so much and just listen to what people had to say. People told me, "Gail, you're coming in from another business, so in order to make changes, do it in a delicate way." Here's a case study about managing: The chairman of your company eliminates an asset, disparages that asset and says that certain behavior is not acceptable. What's the lesson here? BERMAN: I don't know what you're referring to! [General laughter.] Here's the thing. The chairman is entitled to his opinion and is entitled to run his business. We're employees of the chairman. If he chooses to do something, that's his prerogative. Life goes on. That's the reality of executive life. That's the lesson. LEE: It reminds us that everybody has a boss. So were you surprised when Sumner Redstone fired CEO Tom Freston? LEE: It was totally unexpected. MCGRATH: Yes, but Sumner has always been a maverick personality. ZARGHAMI: Everybody in senior management feels vulnerable. If this can happen, anything can happen. Cyma and Judy, you had worked with Tom Freston for more than 20 years. Has his departure made you think about leaving? ZARGHAMI: The thought of going never crossed my mind. MCGRATH: Certainly I have thought about leaving over the years, but MTV has been such a great platform for all kinds of things. I was here in service to the brands and the people who work here. That's still true. When Tom left, I thought, I've gotta come in the next day and let people know we have a plan and a great company. And tell them that you'll stay? MCGRATH: Well, you know, I'm here. And I'll be back tomorrow. Look, I'm in it to win it. Does a new CEO change your lives? BERMAN: I don't think so. Philippe [Dauman] came to Los Angeles three or four days after he took charge. He's agreed to our plan. That gave us confidence. ZARGHAMI: One of the great things about having Tom in the CEO job was that I knew everybody all the way to the top. I knew how to present to Tom. I knew the kinds of questions he asked. Now we have to reinvent the ways we communicate. What in your childhoods or early lives prepared you to handle the heat? LEE: I grew up in an Army family. We moved around a lot. My dad never set boundaries for me as a girl. When I moved to Greensboro, N.C., in the sixth grade, they elected me class president because no one else wanted it. It was a terrifying experience and set the tone for the rest of my life. ZARGHAMI: I played a lot of sports, lacrosse mostly. I'm not scared of competition. MCGRATH: My mother said, "The nun isn't always right. You have your own opinions." It served me well. BERMAN: I grew up with three sisters, the third of four girls. My father prepared us for a man's world. He would literally say, "It's a man's world. How are you going to take care of yourself?" What was your smartest career decision? BERMAN: Changing my career every decade. That wasn't deliberate. But it was deliberate to try something else, never in anticipation of the next job. I was a producer. It never occurred to me that I'd be the president of a network or the president of a studio. As the only woman who has done both, it's remarkable to me that I did it with no planning at all. LEE: My smartest decision was coming to BET. I was at a corporate law firm in D.C. We didn't have cable yet. BET was a client - a six-year-old company with 80 employees and just ten million subscribers. The partners in my law firm said, "What? You're going where?!" I remember being told that I was stepping off the fast track. But I believed in the mission. I had grown up with brands like Ebony and Motown. And I grew up in the segregated South, in Greensboro, so a black-owned business was really important to me. MCGRATH : When I left Cond� Nast for MTV, I had never seen MTV. People told me, "It's so tacky. You're crazy. It'll never last." But I wanted to follow the music. What big mistakes have you made over the years? ZARGHAMI: In Britain the sense of humor is just not the same. Nickelodeon's idea of "Kids Rule" [the network philosophy] isn't necessarily going to work there. It took us a while to learn how to be truly local. LEE: We shut down BET International about five years ago. We were in South Africa, France, Poland, Japan - about ten countries altogether. We were a little early in those markets. We should have stuck with it. But it was a case of "Gee, we ought to make our numbers this year." It was shortsighted. Our music and culture travel. Now we're just in Canada and the Caribbean. We're focusing on Britain and Japan. MCGRATH : Here's a mistake: We were pitched "Project Runway." We passed. MCGRATH: It was kind of a "Let's watch a designer talk about suede" show. I didn't see the possibilities. BERMAN: Oh, there are tons of those mistakes. What's the most important strategic decision you're thinking about right now? ZARGHAMI: We have to figure out how to keep delivering great content. The next "Ren & Stimpy," the next "SpongeBob," the next "Dora the Explorer" might come from a short on TurboNick [a Nickelodeon broadband site] rather than from the television-development stream. MCGRATH: The challenge is taking a vast organization that has been successful in one medium and steering it to another one. Everybody in the company wants to be digital. That's where the action is, where the buzz is. We're brand builders. We haven't built our company on major acquisitions. We have to make sure we have the talent in-house who understand the digital medium. LEE: We got into the mobile business a year ago. Right now it's mainly ringtones. The next step is, What works in terms of programming on a cellphone? We haven't figured that out yet. The last thing we want is someone to come in and create brands that supersede our brands. Gail, what's the change at Paramount all about? BERMAN: I came into a culture in upheaval - changing from the very core. We're going to be a filmmaker-driven studio. We're interested in getting back in the tent-pole business, creating franchises. "World Trade Center" and "Jackass Number Two" say a lot about our strategy. I'm not trying to be funny. Our strategy is about quality films, risk-taking and appealing to young adults and families. We're also interested in new filmmakers, which the studio hadn't been for a long, long time. Is it fair to say that Viacom has moved too slowly in the digital game? MCGRATH: I don't think that's fair. We're the largest creators of content for cellphones in the whole world. We have thriving web properties. You know, we were declared dead and over by AOL Music not that long ago. Hello! Same thing with Napster, Friendster, you name it. ZARGHAMI: MTV Networks goes from cradle to grave. There's a hell of a lot going on. We bought Neopets last year. We now have the largest kids' online share with Neopets and Nick.com combined. Do you wish that Viacom had bought MySpace? ZARGHAMI: There's always a lot of "coulda, shoulda, woulda." I have great respect for MySpace. It's symbolic of an incredible change in youth entertainment. But I'm not sure it's the be-all and end-all. MCGRATH: Look, it's early in this game. And there are going to be lots of players and lots of opportunities. I don't think that there's ever "the one that got away." LEE: It's difficult to say how long any site, even MySpace, will remain popular. We started, with Microsoft (Charts), one of the first African-American sites. It was called MSBET at the time. There were ten other African-American sites, and they were all going to go public and blow up bigger than BET. BET.com is one of the few left. Consumers today want to generate and control content. How does Viacom respond to that? MCGRATH: Our niche and our play will be to let you have access to this great content, and you can morph it and mash it. We will offer the best of both professional and user-generated content. LEE: Yesterday I heard about a mashup [combining content to create something new] between Britney Spears and O.J. Simpson. We have to provide an outlet for that sort of user-generated content on air, on BET.com or on mobile. BERMAN: The next great film content will come from people who are now working on IFILM or YouTube or any of the sites that encourage self-expression. ZARGHAMI: There will never be an exact kids' version of YouTube. Multiplayer gaming is a form of social networking that may be as exciting for kids as MySpace is for its demo. Why hasn't the reality-TV trend reached the movies? "Jackass" is kind of a reality movie. Why can't "Laguna Beach" be a movie? MCGRATH: No, I was just kidding. "Jackass," I mean - they're not your average guys. BERMAN: No, they're not your average guys. "Jackass", though, is a great centerpiece for reality going to film. But it has not been tapped into in the right way yet. Somebody will figure that out. How do you get the exhibition experience of a movie to feel immediate and interactive with the audience? If it doesn't feel original, why would anybody spend ten bucks to see it? Tell me something about youth culture that I don't know. MCGRATH: For years we've asked, "Who do you admire?" The answer would usually be Bill Gates or Serena Williams or somebody like that. No.1 for a while now is "my parents." ZARGHAMI: Between 60% and 70% of all kids go to some kind of church services. BERMAN: I'm fascinated that kids stand next to one another and have more interest in IM-ing each other than in talking. LEE: African-American teens are terrific users of technology, much more than the general market. In the mobile space it's amazing. My son has a ringtone for me. Last time I checked, it was Will Smith's "Parents Just Don't Understand." Do your children want to be like you? LEE: My daughter does. One day I came home and she said, "How was work?" I said, "It was frustrating. All I did all day was say no." A month later I asked her what she wants to be when she grows up. She said, "I want to be CEO of BET." I said, "Really? Where did that come from?" She said, "I like saying no." ZARGHAMI: It's not the same every day. One day you come home and say, "The house is a mess. My husband hates me. My kids can't read. But 'Fairly OddParents' got a 12 [rating]." The next day, your kid wins the award for being the most valuable player on the hockey team. MCGRATH: The best thing you can do is to say, "I had a great day." So once in a while, I'll come home and say, "Man, this is really great. I got this crazy show pitched to me, and it was really fun." I try to do that so she'll think that going to work is a good thing. BERMAN: I worked for Dolly Parton for many years. She was doing Steel Magnolias with a bunch of other actresses. Somebody came up to her and said, "Hey, some of the other people are cranky in the heat, but you're always so nice and lovely." She looked at him and said, "Honey, I could be digging ditches in this heat." That's right. We could be digging ditches.